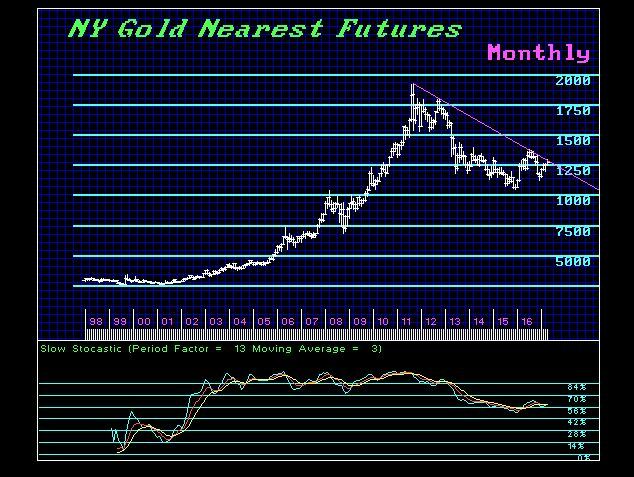 QUESTION: Marty; You said gold was still vulnerable in dollars but that the low was probably in place in Euros. I have been trying to reconcile that statement in my mind. The only way that happens is a real crisis in Europe and a strong dollar. Correct? It seems really naive that people get bullish on a few weeks of price movement and predict the next 10 years. The dollar first is week with Trump and bullish euro for Macron? Right? Thank you for a lone voice in the wilderness of analysis. ANSWER: Yes. Just compare the two chart patterns. Notice that gold in euros bottomed back in December 2013 compared to December 2015 in dollars. The numbers will not come down unless gold makes a new low in dollars. Then the breakout will drop from the 1362 level. 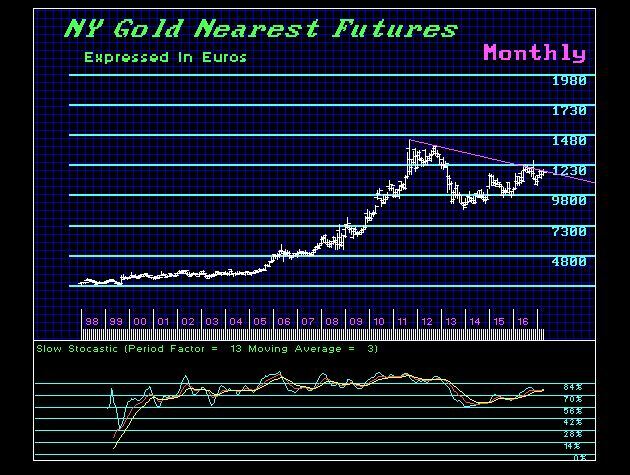 Just looking at gold in euros exposes the real trend. The fools keep saying see the euro rallies and the dollar declines so I have to be wrong. The European Central Bank is the one at risk of collapsing. Draghi bought 40% of all Eurozone debt. He raises interest rates at his own balance sheet takes the hit. This fool is really in trouble and then you have Germany turning against the Draghi. Neither the Fed nor the Bank of Japan are in such a dangerous position. The perpetual dollar bears cannot see the light. Just how is the world economy going to crack with a lower dollar? They look at the dollar as if it is a SHARE PRICE up is bullish and down is bearish for America. Currency is the opposite of share prices. The higher the currency, the greater the deflation and the lower the economic growth. They never heard of “competitive devaluations” or currency wars. Every crisis has come with a rising dollar. The solution was a dollar devaluation as Roosevelt did in 1934. They look at everything backwards and that’s why the lose a fortune consistently buying highs. 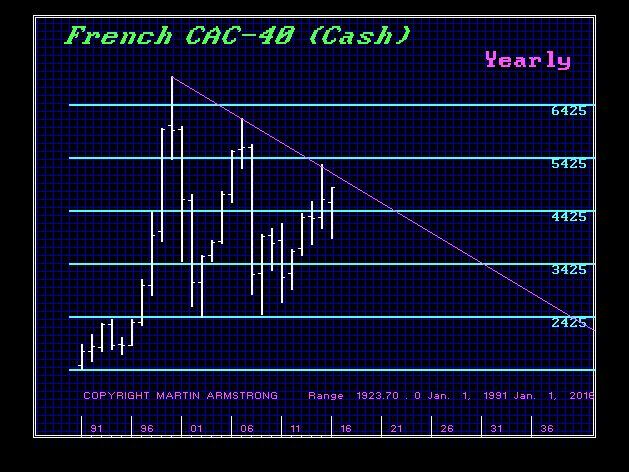 Here is the CAC40 of France. The high in the French stock market is 1999. Yet everyone is cheering as if the US is down and Europe is the new wonderland? Compare the German stock market in euros and in dollars. It has finally made new international highs only in 2015. We have to look at everything from a global perspective. The new highs in the Dax in international terms is ONLY because of the decline in the euro. With the bounce in the euro, the Dax will rally in euros, but only to a point. A spike up in the dollar can be achieved from political chaos, but also geopolitical. Only a rise in the dollar will break the system and end the dollar as the reserve currency. The debt crisis we face is building and with higher interest rates, then there will be the risk for major loses overseas and capital will contract once again. 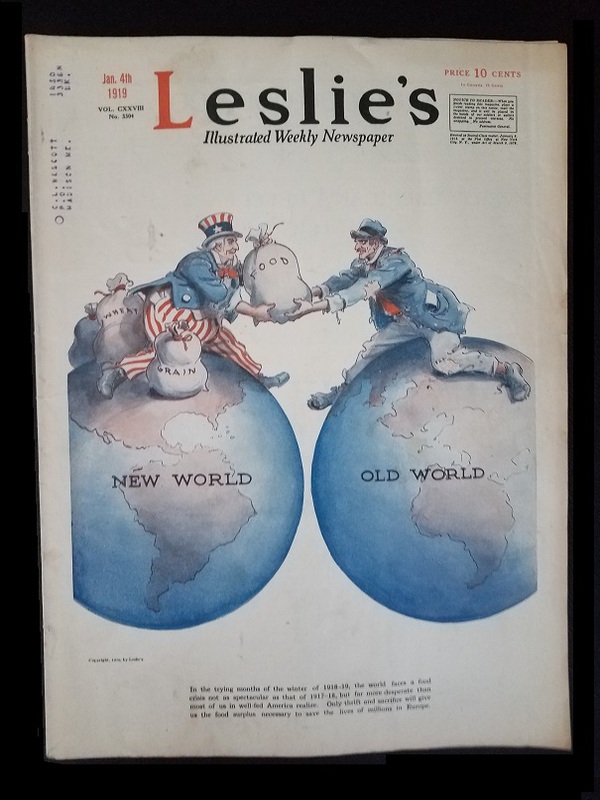 It was the US capital outflows that rebuilt the world. A lower dollar encourages overseas investment. A higher dollar causes a contraction. Only a total idiot forecasts the long-term by one month worth of price action. We need these fools to make the trends. Somebody has to buy the high and sell the low. This entire political-geopolitical mess us starting to bubble up. Why are two Republicans, McCain and Graham, acting as Trump’s worst enemy trying to destroy the Republican Agenda? They are being paid by their lobbyists to protect the corrupt establishment. They are against their own Party and should just join Hillary on vacation. Oh that’s right. They have the same backers. Graham’s number one contributors are law firms really on behalf of their clients to hide the source of the money I believe.